ALSO: Video interview with Los Angeles Kings winger Dustin Brown, and an audio interview with goaltender coach Bill Ranford. here during a recent practice session. 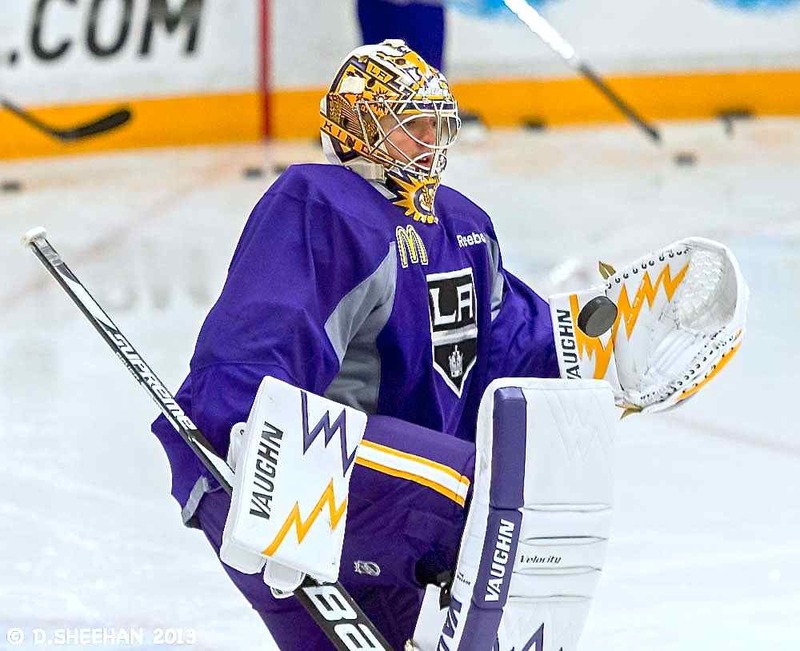 EL SEGUNDO, CA — Prior to the start of the Los Angeles Kings 2013 Training Camp, backup goaltender Ben Scrivens talked about his transition from the Toronto Maple Leafs, and he hinted that although his work over the summer with Kings goaltending coach Bill Ranford was positive, the changes the Kings wanted him to make in how he plays did not necessarily mesh with how he was taught by former Maple Leafs goaltending Francois Allaire (now the goaltender coach for the Colorado Avalanche), and current Maple Leafs goaltending coach Rick St. Croix. Despite the differences that Scrivens hinted at, he was quite positive about the situation. Fast forward to late October…Ranford says that Scrivens is making progress. Ranford and Dillabaugh also wanted Scrivens to play with more tempo and urgency, and work on his hand position. “Then, the other aspect is he’s just kind of worked on his hand position a little bit, and just being a little bit more reactive with his hands,” added Ranford. When asked if there might be a little resistance to his teachings from Scrivens, Ranford explained the different style that Allaire teaches. Ranford said that he is not trying to force Scrivens, or any goalie, for that matter, to adopt a particular style. Good insight. The book on Scrivens was that he gives up big rebounds that result in goals. If he can stop just blocking and try to figure out how to control rebounds and be ready for second shots, that will be a huge improvement in his game. Quick’s rebound control is exceptional – now you have to wonder if he learned that under Ranford.